Phoenix – After a brief respite from buying commercial properties in the Valley, Regent Properties LLC of Los Angeles, Calif. (Jerey Dinkin, Douglas Brown, Eric Fleiss, partners) has jumped back on the horse with the $66.4 million ($205.95 per foot) purchase of a 322,406-square-foot oce project located at the northwest corner of 24th Street and Highland Avenue in Phoenix. The two-building complex, called Camelback Commons, is comprised of a 161,845- square-foot structure at 4722 N. 24th Street and a 160,561-square-foot oce at 4742 N. 24th Street. The seller was MS MCC Highland LLC, which was formed by Morgan Stanley in New York City, N.Y. (NYSE:MS) and McCarthy Cook & Co. in Costa Mesa, Calif. (Thomas McCarthy, Edward Cook, III, co-presidents). The deal was brokered by Barry Gabel and Chris Marchildon of CBRE in Phoenix, along with Kevin Shannon, Ken White, Paul Jones and Rick Stumm, all formerly of CBRE and now with Newmark Grubb Knight Frank in So. Calif. The oce space is 82 percent occupied. 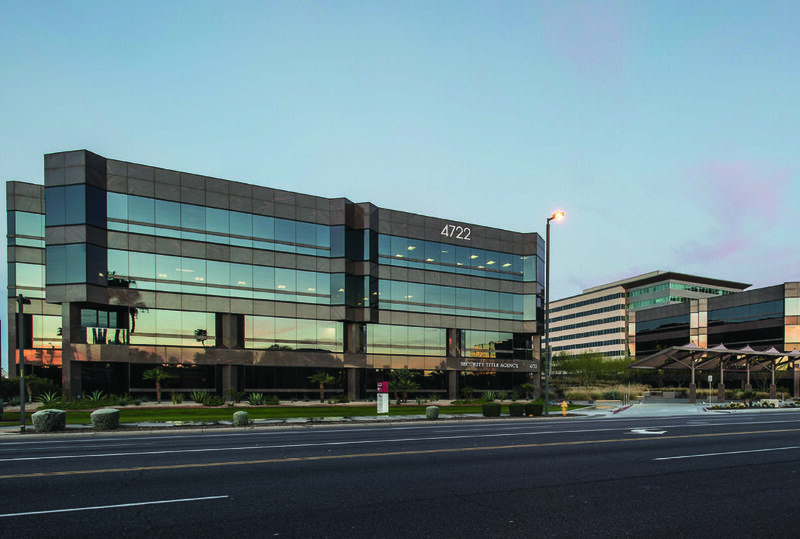 The leasing is being handled through Phoenix-based Lee & Associates agents Andrew Cheney, Craig Coppola and Gregg Kafka, who also assisted with the sale. Fleiss says Regent Properties plans to complete a multi-million dollar upgrade to the 4.91-acre property, which was developed in 1985 and 1986. Regent Properties made the investment through a fund called AR Pool III LLC (sole member is Atlantic Regent REIT Inc.). Maricopa County records show AR Camelback LLC (Regent Properties entity) acquired the asset with a $25 million down payment and a $52.8 million loan from Compass Bank, which presumably leaves $11.4 million for improvements, brokerage fees and other costs associated with attracting tenants to lease the 65,000 + sq. ft. of vacant space in the two, four-story buildings. The Lee & Associates agents are looking for tenants needing from 750 sq. ft. in a single suite to 42,258 sq. ft. of contiguous space comprised of the entire third oor of the 4722 N. 24th Street oce. In October 2010, the Morgan Stanley/McCarthy Cook venture paid $27.25 million ($84.52 per foot) to acquire the oce buildings at 24th Street and Highland Avenue. With the purchase of Camelback Commons, the Regent Properties portfolio in the Phoenix area now includes just under 1.673 million sq. ft. of oce space in eight developments and 169,497 sq. ft. of R&D space in one project. Regent Properties invested $290.675 million ($157.76 per foot blended average) to buy those properties over the past seven years. Excluding the newly-acquired oces and 227,381 sq. ft. of oce space Regent Properties purchased in two deals in 2010, almost 1.293 million sq. ft. of the oce and R&D space was added in 2014 and 2015. Camelback Commons is the rst investment in the Valley for Regent Properties in nearly two years. “We think this is a great time to invest in Phoenix,” says Fleiss, who adds that Regent Properties is “always looking for more properties” in the Valley. According to the company website, Regent Properties has $1 + billion in real estate assets under its management across the U.S. Sam Kraus, head of acquisitions at Regent Properties, is at (310) 806-9800. Talk to Cook at (714) 913-6900. Reach Gabel and Marchildon at (602) 735-5555. Call the Lee & Associates agents at (602) 956-7777.